Angel Number 000 … What Does It Mean? What is the meaning of 000? Seeing recurring number sequences is a common sign from the angels and the realms of spirit. However, as someone just pointed out to me, up until this point I have never talked about 000! So what does 0, 00, or 000 mean in angel numbers terms? 0 is actually a very common angel number to see…. The first and most obvious meaning of seeing 0 is Oneness. 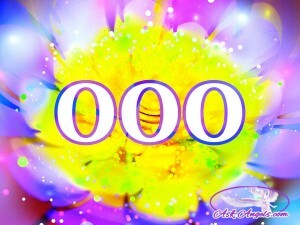 0 is like a circle in that it is unending… Seeing it is a sign of you oneness with the God, your angels, and All That Is. Seeing the angel number 0 is a call to open your heart, tune into your intuition, and tap into your direct connection with the Divine and all of the guidance, healing and uplifting frequency available for you therein. So what does 00, 000, and 0000 mean? Seeing multiple 0’s …. 000, 00, or 0000 contains the same meaning as 0, just doubled, tripled, or supercharged! For example… In addition to seeing your oneness with everything, and connecting directly with the guidance of Spirit, the meaning of 00 carries the message that Divine and angelic guidance is available for you right now! When you see 00… Pay attention! Look for signs and listen for guidance from your angels and the Divine. Your angels may be encouraging you to pray, meditate, or take action on the guidance you have already received when you keep seeing 00. Quiet your mind, open your heart, tune into the light that is all around you and focus within to tune into the guidance of Spirit. Seeing 000 also highlights your Oneness with All That Is, and it points to the incredible power and potential you have to create positive change in your life and in the world. Open your heart to connect with Divine light within you! 000 is also a reminder that your energy in every moment has an impact on what you’re creating. Stay positive, think about and focus upon what you want to see and experience, and know that when you open your heart, elevate your vibration, and link with the Divine and with your angels anything is possible! Listen for guidance, trust your intuition, and know that now is the time for you to take action towards manifesting your goals when you keep seeing 000. 0000 usually appears when a situation has come full circle. It reminds you of your ability to let go and let God… When you see 0000 know that you’re at a powerful point of new beginning. When you’re in alignment with the Divine, and open to receive the guidance of your angels, you’re in a powerful position to step into the infinite, unending possibility before you. Open your heart and allow Divine love and guidance to fill you. Ready to learn more about the meaning of numbers? Try our free Numerology Reading to see what the numbers of your name and birthday say about you! Access the Free Numerology Reading Here! Or check out the image below to learn more about the meaning of common angel number sequences! If you’re on a phone/ tablet, or you would simply like to view a bigger version of this Angel Number Sequences image… Click Here or Click the Image Below! P.S. Was this post helpful for you? Do you see 000 or other angel numbers? I love hearing from you… Comment below and let me know! Angel Number 333, What Does It Mean? Angel Number 555… What's the Meaning of 555? Hi There , I keep on seing on the clock 12:00 & 00:00 constantly what does it mean ? I have se en 0000, 55, 555, 1111, 444 and 1444 several times. (I copy and pasted that, that’s why there’s so much space, I think I held down the space bar while I laid my head down). After that, I thought it was a sign, and thought (at first) it binary code, so I search it up, find nothing for a while, than I find this site. I wonder what the ellipsis means… (in this case) also, I kind of already thought of both the 000 and the 0000 things (exactly when it happened, come to think of it :O ), so this just confirms what I was thinking. Again, thanks! My brother says he keeps seeing the time 9:11 and has nothing to do with the twin towers? ?? What does 1:19 mean? I read the article about 911, but keep seeing 1:19 on clocks and timers….mostly timers.